Japan and China agree to bolster economic cooperation amid concerns over trade war with U.S.
BEIJING - The finance ministers of Japan and China agreed Friday to bolster economic cooperation, with concern growing that an escalating trade war waged by U.S. President Donald Trump will continue to rattle global financial markets. Officials from the finance ministries and central banks of the two neighbors also joined the China-Japan Finance Dialogue, which was last held in May 2017 in Yokohama. Those from financial services agencies also participated in the talks for the first time. The meeting follows Aso’s talks Thursday with Chinese vice premiers, Liu He and Han Zheng. During the meetings, Japan and China voiced agreement that trade protectionism will not benefit any country, Aso said, warning against Trump’s implementation of higher tariffs against other nations. Speaking to reporters after Thursday’s meetings, Aso also said that the two countries acknowledge the importance of bolstering financial cooperation, amid growing fears that an intensifying U.S.-China trade war will hurt the global economy. Aso said Tokyo and Beijing are making efforts to “achieve tangible results” for an envisioned summit in October between Prime Minister Shinzo Abe and Chinese President Xi Jinping. In May, Japan and China agreed to resume their currency swap line in times of financial emergency, while Beijing promised to grant Tokyo a 200 billion yuan (about $29 billion) investment quota in yuan-denominated stocks and bonds. Sino-Japanese ties have long been mired in a territorial row over the Senkaku Islands, which are known as Diaoyu in China. Tensions escalated after the Japanese government effectively put them under state control in September 2012. Bilateral relations, however, have been improving, with both sides reflecting positively on the 40th anniversary this year of the signing of the friendship treaty between the two countries. On the back of the improvement in ties, a number of senior Japanese politicians have made visits to China. Toshihiro Nikai, secretary-general of Abe’s ruling Liberal Democratic Party, arrived in Beijing on Wednesday and met with Chinese officials the following day. The LDP’s No. 2 figure is set to hold talks with Chinese Vice President Wang Qishan on Friday. 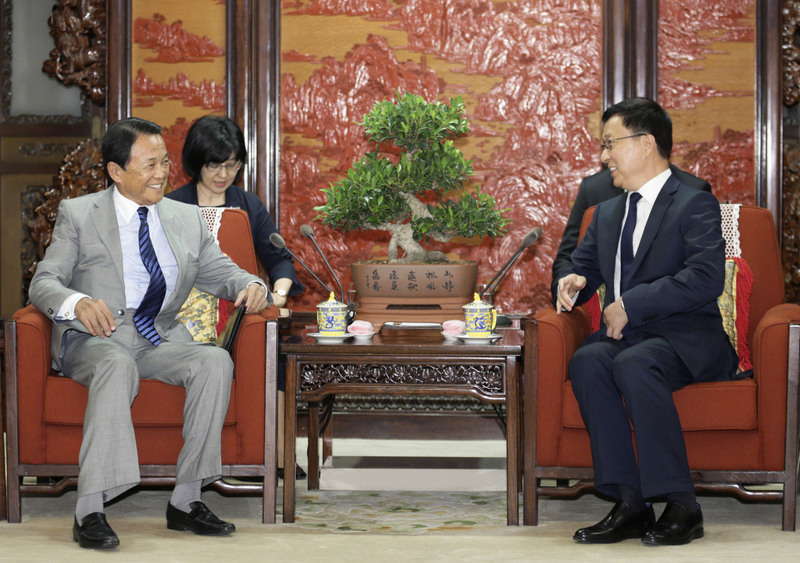 Education minister Yoshimasa Hayashi attended a trilateral meeting with his Chinese and South Korean counterparts in the northeastern Chinese city of Harbin on Thursday.